Have you arrived at a dinner party and felt awkward about not knowing where to sit? Has the host seemed overwhelmed with guests arriving and last minute dinner preparations? Or have you ever had to sit away from your spouse, sibling or best friend because you arrived a little late to the party? Do yourself and your guests a favor this Holiday Season and organize the seating at your dinner party with this simple and free Christmas Dinner Place Cards template. This year avoid the confusion of your guests asking where to sit by downloading this easy to use and customizable template in advance. It is free and ready to download by clicking the link provided. 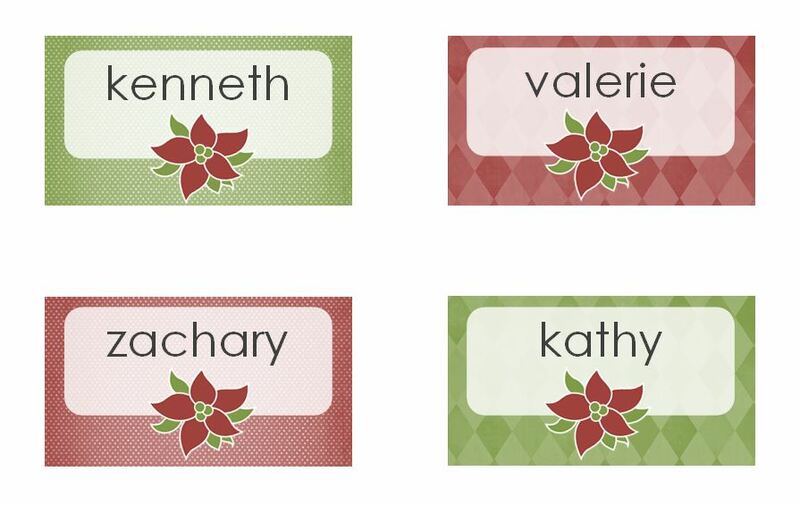 For your holiday party, this download includes a festive dinner place card template with eight 2 x 3.5 inch poinsettia designed cards. The Microsoft Word template provides a fast and easy way to generate creative and fun Christmas Dinner Place Cards while presenting a classy and polished form. First, click download and note the customizable Christmas Dinner Place Card template opens up automatically in Word. Second, note that the template opens with demo names included on each place card. To change the demo name hover the mouse pointer over the name and double click into the text box. Type the desired name into the text box. Third, once all the Christmas Dinner Place Cards are updated press ‘Print’. First, before printing click ‘Print Preview’ to ensure your place cards will not be cut off. This avoids wasting paper and your time. Second, once you are satisfied with your customized place cards, save the Word Template for future use. Third, for a more polished look print your finalized name cards onto labels and stick onto card stock. Additionally, consider folding the card stock in half to create standing Christmas Dinner Place Cards. Enjoy this free downloadable template today and make planning your Christmas Dinner Party a little less hectic this year.